Robert James Shiller (born March 29, 1946) is an American Nobel Laureate, economist, academic, and best-selling author. He serves as a Sterling Professor of Economics at Yale University and is a fellow at the Yale School of Management's International Center for Finance. Shiller was born in Detroit, Michigan. He studied at Kalamazoo College and the University of Michigan where he received his B.A. degree in 1967. He received the S.M. degree from the Massachusetts Institute of Technology (MIT) in 1968, and his Ph.D. from MIT in 1972. 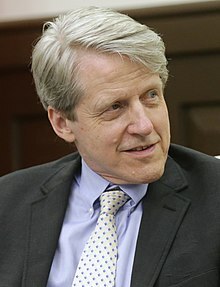 Shiller has been a researcher of the National Bureau of Economic Research (NBER) since 1980, was vice president of the American Economic Association in 2005, and president of the Eastern Economic Association for 2006–2007. Eugene Fama, Lars Peter Hansen and Shiller received the 2013 Nobel Prize in Economics. ↑ "The Closing: Robert Shiller". The Real Deal. November 1, 2007. Retrieved December 2, 2012. ↑ "ICF Fellows". About. Yale University School of Management. Retrieved 21 September 2012. ↑ Van Sweden, James (October 22, 2013). "Alumnus Wins Nobel Prize". www.kzoo.edu. Kalamazoo College. Retrieved October 31, 2013. ↑ "Past Presidents". Eastern Economic Association. Retrieved February 9, 2017. RSA Vision webcasts – Robert Shiller in conversation with Daniel Finkelstein on "How Human Psychology Drives the Economy"
This page was last changed on 17 November 2018, at 09:25.